Make clear what the objectives of the evaluation of a gender-responsive safety policy are. The evaluation stage is important because it permits establishing whether or not public policies, and the programmes and actions within these policies, were effective in promoting women’s safety in the city and whether or not the objectives and results identified in the design of the policy have been met. Evaluation also permits analyzing how the policy has really been implemented, identifying critical points, gaps, promising practices and choosing alternatives for improvements in the public policy, and obtaining information about the results of the policy. Evaluation permits, on the one hand, that the government be informed about the effectiveness of actions in achieving proposed results, and, on the other hand, that civil society obtain the information, training, and means to follow up on state actions. Manual de Diseño de Políticas Públicas Locales con Enfoque de Género. Técnicas de facilitación y proceso metodológico (Manual for Designing Local Public Policies with a Gender Perspective: Facilitation Techniques and Methodological Processes) (Apoyo a la Descentralización en Espacios Rurales (APODER), 2008). Red de Municipalidades Rurales del Perú (REMURPE), Peru. This manual is organized into four chapters that establish the link between public policy and a gender focus and provide methodological guidelines in order to promote the process of incorporating a gender perspective in municipal policies with specific strategies for implementation. The final part of the document centres on the evaluation and monitoring of public policies, and establishes different tools and procedures for evaluating them. A matrix model is developed to evaluate the process of implementing a public policy, which includes the following aspects: public policy objectives, timeframe required, advances to date (considering the indicators), what remains to be done, responsible parties, and observations. Available in Spanish. Develop indicators that can be used to evaluate the results of public policies. Indicators are tools used to measure changes, such as changes to gender relations. As with all comparative measurements, these indicators serve to compare similar objects or situations at the same moment or the same object across a span of time (Cepal, 2006: 22). While several recommended indicators in the field of violence against women are now more widely available and endorsed by experts, the field of Safe Cities and gender-based violence against women and girls is especially incipient and emerging. As such, adaptation and testing of monitoring and evaluation methodologies and indicators specific, for example, to sexual harrasment and sexual violence in public spaces may be more experimental and the advice of data and research experts would be advisable whenever possible. Evaluate the level of participation of different actors, including women’s organizations, in the development of public policies and their implementation. Public policies should result from the interaction between different state and societal actors. As such, in formulating a gender-focused safety policy/programme/action, it is important to return to the relevant actors, including women’s organizations, in order to evaluate the level of involvement each has had in developing and implementing the policy and programmes - the roles they assumed, the actions they developed and to what extent their proposals were incorporated into the different programmes and interventions. The following box provides an example of possible dimensions and indicators to take into account when evaluating the level of participation and involvement of each programme partner. (Review and Methodological Contributions to the Regional Programme Cities without Violence against Women, Safe Cities for All, executed by UNIFEM with the support of the Government of Spain/AECID, implemented by Women and Habitat Network of Latin America and the Caribbean). Unpublished material. 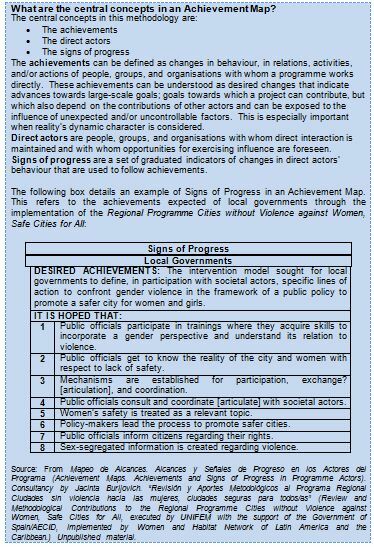 Make an Achievement Map of the results of a policy/programme/action aimed at promoting a safer city for women and girls. An Achievement Map is a participatory methodology that is used to evaluate policies/programmes/actions. Achievement Maps allow local governments to be held accountable to citizens regarding the results achieved in relation to violence against women, and at the same time provide the opportunity to incorporate lessons learned about accomplishments and necessary adjustments to consider in order to reach desired results.